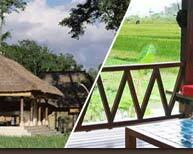 Set in beautiful rice fields on the southwest coast of Bali, Tamu Seseh takes you back to the very essence of this beautiful tropical island with rice fields stretching to the horizon. Beaches and temples, traditional village life. No hawkers. No hassles. 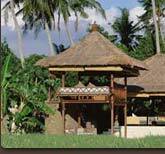 Your holiday, your dream of Bali. Just 20 minutes from Seminyak, on the southwest coast, Tamu Seseh is close to the ancient temple of Tanah Lot and is conveniently located for golf at nearby Bali Nirwana Resort and with easy access to the mountain areas of the island and many of Bali's famous surf breaks. 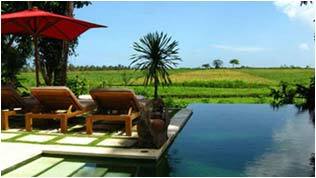 At the end of a winding road through the rice fields is a beach, and a traditional Balinese fishing village called Seseh. 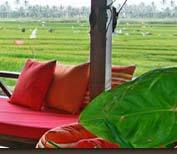 Enjoy a holiday in a location of unparalleled tranquility, surrounded by the sounds of crashing waves amid a sea of rice. Enjoy sunny days and warm tropical nights, in casual luxury with state of the art pleasures and sumptuous local and western dishes served in your private, thatched dining pavilion. 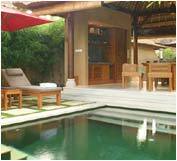 Every villa features a private swimming pool. Air conditioned bedroom suites are equipped with beautiful teak queen size four poster beds. 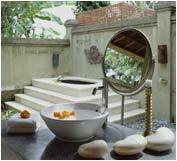 Each suite opens to a private garden courtyard bathroom with showers amongst the ferns and bathtubs under the stars. 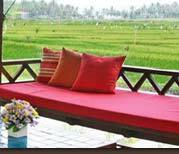 Each villa has a unique elevated relaxation pavilion with daybeds providing stunning views across the rice fields towards the sea. Fully equipped kitchen, in-room safe, CD and DVD players, satellite TV and mountain bikes for exploring the local area are included with each villa. Laundry service is available at extra charge. Massage and spa services are available by appointment.